Jyoti's Pages: Holi Wishes and little chit chat! I know my wishes are coming a day late, but still its never late to convey best wishes on festive occasions. 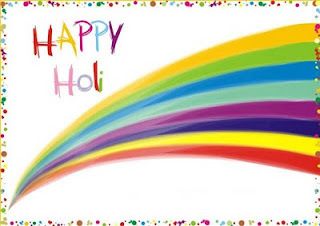 Hope you all had a happy, safe and colourful 'Holi'. Holi is the Indian festival of colours. It marks the victory of good over evil and to celebrate it people play with colours. It stands for reaffirmation of hope and goodwill. To know more about it read this. We had a holi celebration event here this weekend. There were a host of cultural performances followed by circus plays. Then, we played with colors and danced to holi songs and the recent bollywood dance numbers. It was great fun! Holi is also a time for good and festive food. We also had our share as I prepared some festive dishes! It was a fun week overall but it was a lazy week in reading. I am still to finish Miss Conceived by Emma Hannigan. Hopefully, I will finish it this week. Most of the time, I was cooking or watching cricket. A big match awaits India on Thursday when they play the Aussies. Fingers Crossed! Holi wishes and let's hope of a dhamaka Indian win. My holi wishes are very belated! ;-) Hope you had a great time.